Here is another of our fun, challenging sheets of head-scratchers. Brain Teasers Worksheet #7 has a poetry unscrambler, a connected squares puzzle, and a (quite terrible) mathematics joke. 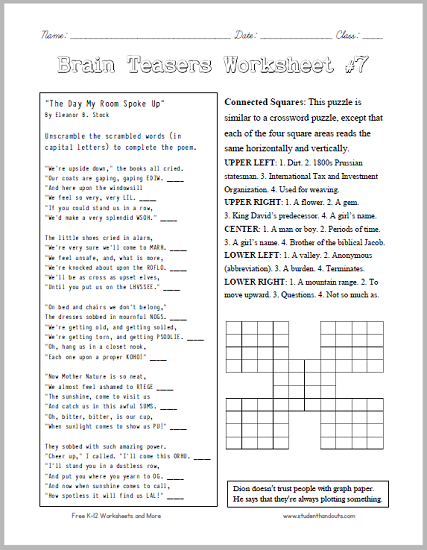 For more of our free printable brain teaser worksheets, click here. UPPER LEFT: 1. Dirt = soil. 2. 1800s Prussian statesman = Otto (as in Otto von Bismarck). 3. International Tax and Investment Organization = ITIO. 4. Used for weaving = loom. UPPER RIGHT: 1. A flower = rose. 2. A gem = opal. 3. King David's predecessor = Saul. 4. A girl's name = Ella. CENTER: 1. A man or boy = male. 2. Periods of time = ages. 3. A girl's name = Lena. 4. Brother of the biblical Jacob = Esau. LOWER LEFT: 1. A valley = vale. 2. Anonymous (abbreviation) = anon. 3. A burden = load. 4. Terminates = ends. LOWER RIGHT: 1. A mountain range = Ural. 2. To move upward = rise. 3. Questions = asks. 4. Not so much as = less. "We're upside down," the books all cried. "Our coats are gaping, gaping wide. "We feel so very, very ill.
"We'd make a very splendid show." "We're very sure we'll come to harm. “We're knocked about upon the floor. "Until you put us on the shelves." "On bed and chairs we don't belong,"
The dresses sobbed in mournful song. "We're getting torn, and getting spoiled. "Each one upon a proper hook!" "And catch us in this awful muss. "When sunlight comes to show us up!" They sobbed with such amazing power. "Cheer up," I called. "I'll come this hour. "And put you where you yearn to go. "How spotless it will find us all!" Ask students, "What is this poem about?"